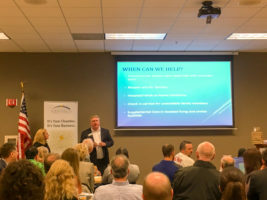 Mike and Kim McCoy recently presented helpful information on home care and respite care to the North Fulton Chamber of Commerce. The Halloween presentation was filled with smart “tricks” to help seniors in the community as well as some sweet “treats” to help encourage participation. If your church group, retirees association, or over 55 group needs a speaker for your next meeting, call the Real McCoys. We can talk to your group about a variety of topics including: fall prevention, dehydration, dementia care, care giver burnout, or payor sources for home care. If you or an aging loved-one are considering Senior Care Services in Alpharetta GA, please contact the caring staff. Email: info@realmccoyhc.com • Phone 404-536-1060. The Real McCoy Home Care is your locally owned and managed in-home, non-medical home care agency. Serving North Metro Atlanta.